I apologize for having to re-accommodate these customers. After refusing to give up his properly assigned airplane seat to an off-duty United Continental employee, Dr. David Dao was assaulted by O’Hare Airport security personnel this spring. Dr. Dao was subsequently pulled from his seat, thrown violently against an arm rest, and then dragged off the plane, much to the horror of the other passengers. We surmise that the answer to our question is related to the U.S. airline industry having become somewhat of an oligopoly; the airline carriers, for the most part, do not depend on customer service to maintain market share. 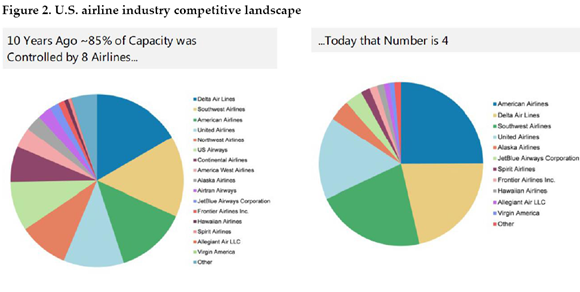 Today, just four airlines (United Continental, American, Delta, and Southwest) control over 85% of U.S. domestic routes, but that statistic underestimates the extent of industry concentration when it comes to airline carriers. Beyond the overall industry concentration that now exists across the country, consumers often have only one carrier option in many airports. United Continental management likely believed that the incident with Dr. Dao would have a limited, if any, effect on the company’s market share and earnings, which is probably why CEO Munoz’s immediate response reflected a tin ear towards public concerns. Similarly, as demonstrated by the muted stock price reaction, investors also believed that any repercussions from this assault would have a minimal impact on United Continental’s market share or earnings. As a company that operates in an oligopolistic industry, United Continental’s management knows that it can more easily generate earnings growth by taking advantage of its considerable market power; that might mean spending less on customer service, raising prices on uncompetitive routes, coordinating with other airlines on routes and airports to minimize competition, and/or leaning on regulators to allow for further industry consolidation over time. As a result, these actions have allowed the airlines to generate record profits today, despite levels of customer service which have arguably never been worse. The seemingly inexorable trend towards corporate consolidation has been a multi-decade trend which goes far beyond just the airline industry. As a result of 35+ years of M&A activity essentially unchecked by antitrust enforcement, corporate concentration has increased in virtually every industry, including wireless telecom services, cable television, hospitals, pharmaceuticals, medical insurance, and many others. The biggest banks, now commonly known as “too-big-to-fail,” are orders of magnitude larger than they were prior to the financial crisis due to increased consolidation, and the unchecked political power of the banking industry has become an increasing worry for voters, liberal and conservative alike. 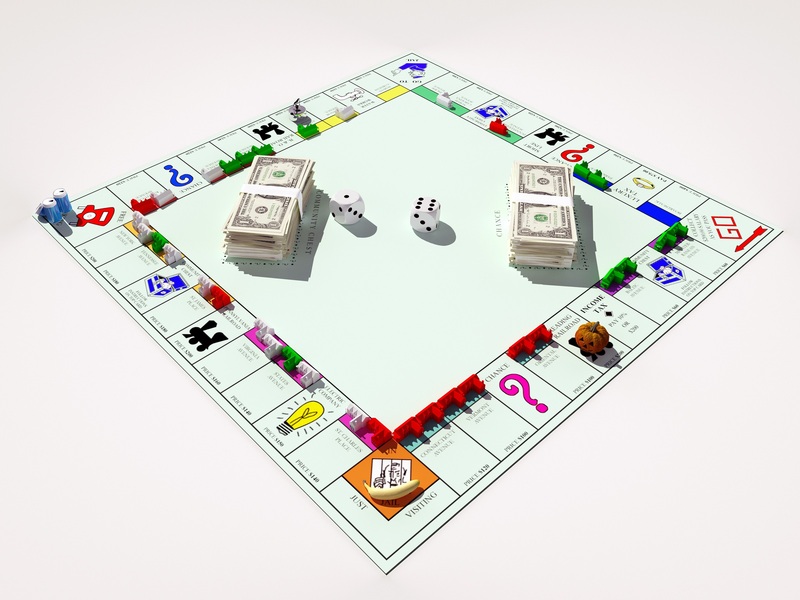 Even relatively nascent industries such as online search, online retail, and social media have become enormously concentrated — all of these categories are virtual monopolies today due to considerable network effects which have been made worse by unchecked M&A activity. Beyond its core service, Facebook now owns WhatsApp, Instagram, and Oculus through acquisition; similarly, Google acquired Android, YouTube, Waze, and DoubleClick. Even Amazon is using M&A to expand its market power; the company recently acquired Whole Foods, a company which represented approximately 50% of the market for natural groceries. Whole Foods, in turn, enjoys its leading market share as a result of buying out Wild Oats, Fresh Fields, and other competing natural grocery chains over the past two decades. The U.S. economy has been in this place before. The late 19th century was also known as the “Gilded Age” because monopolies were blossoming at that time much like they are today. The Gilded Age term was coined by Mark Twain to describe a period where everything looked shiny on the surface but was corrupt underneath. Back then, railroads, steel, and oil were the major monopolies. Like today, the late 19th century was a period of incredible technological innovation, rapid economic growth, and increasing wealth inequality. Also, like today, the social instability caused by towering corporate concentration led to a rise in populism; William Jennings Bryant ran a very competitive election race for President in 1896 and in 1900 by attacking “moneyed interests” and American imperialism. To limit the political power and destructive economic impact of corporate monopolies, the U.S. Congress passed the Sherman Antitrust Act of 1890. According to the Supreme Court, the purpose of the Sherman Act “…is to protect the public from the failure of the market. The law directs itself not against conduct which is competitive, even severely so, but against conduct which unfairly tends to destroy competition itself.” In 1911, the Supreme Court relied on this law to break up Standard Oil, which enjoyed ~90% market share in the oil and gas industry at the time. However, during the past 35 years, antitrust has become a low priority for every Presidential administration, Republican and Democratalike. 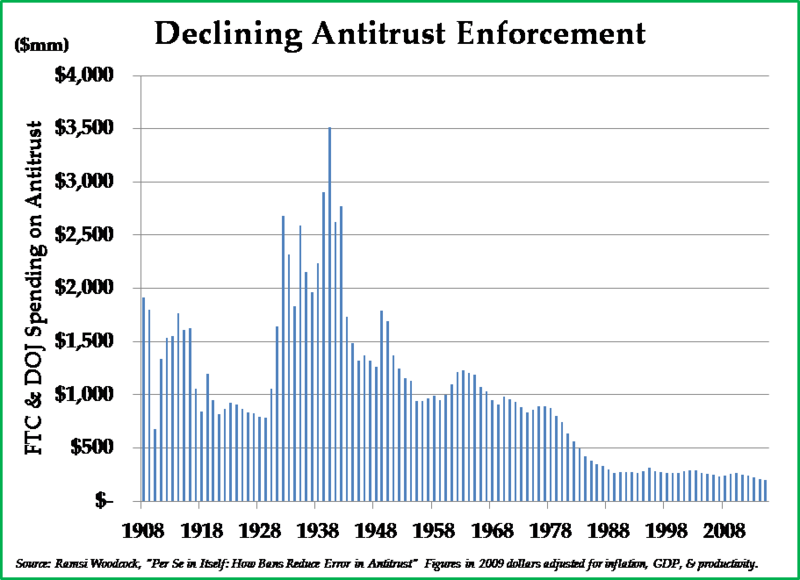 Antitrust enforcement declined precipitously after the last major anti-monopoly enforcement case that was prosecuted successfully against AT&T in 1982. The chart set forth to the right illustrates how the importance of antitrust enforcement to policymakers has evolved over the span of the past hundred years. Since the 1980s, antitrust simply has not been a priority for policymakers. For large company CEOs, monopolies are fantastic. The larger the fiefdom that a CEO is able to oversee, the more market power the company wields, thus typically leading to higher CEO compensation. Large company CEO compensation has increased exponentially in recent decades, in part as a result of unabated M&A activity. For consumers, increased competition means more options from which to choose. A competitive market offers more options for consumers than an uncompetitive market with just one or two companies. Conversely, monopolistic markets such as the cable industry leave consumers with unattractive prices and poor service levels. For entrepreneurs, it has become increasingly difficult to form a new business due to increasingly high barriers to entry. 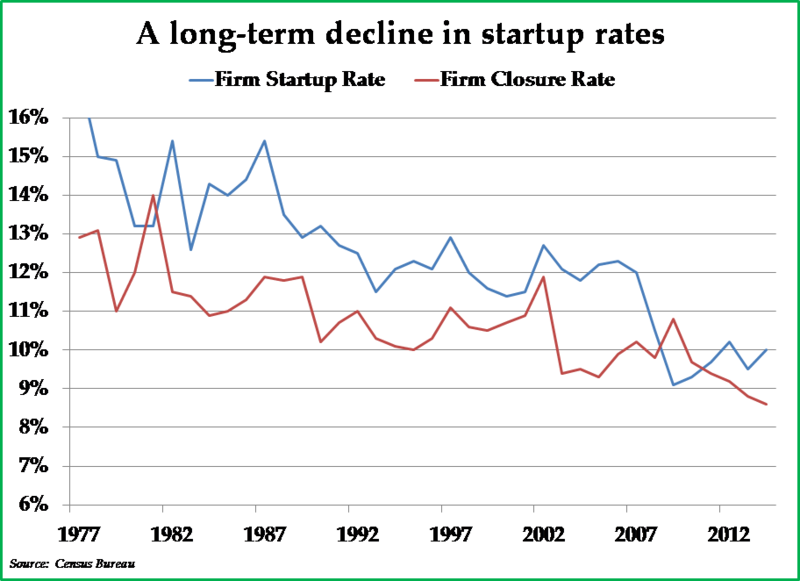 While new companies are still being formed in isolated sectors such as the technology industry, the startup rate is near a record low across the wider economy. 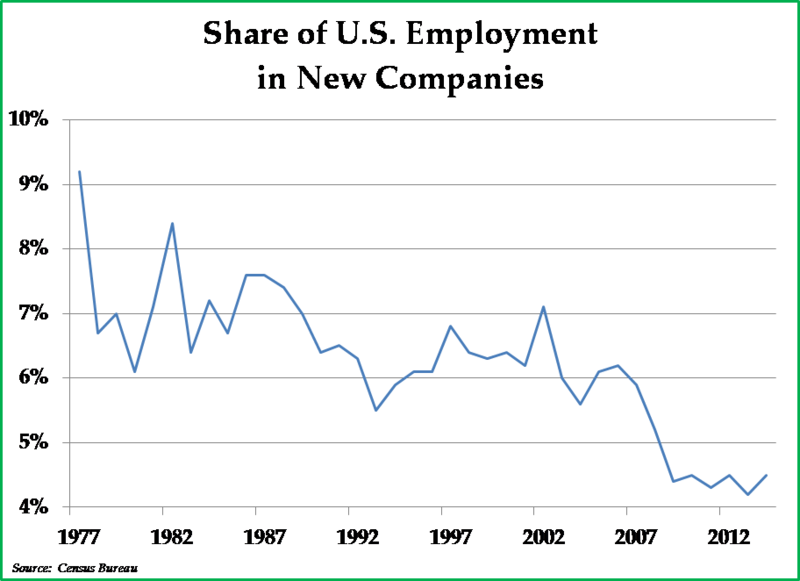 Lower new business formation reduces the dynamism of the U.S. economy. For employees, finding employment opportunities becomes more challenging in an economy dominated by oligopolies. Large companies tend to be net eliminators of jobs, while new companies tend to be net creators of jobs. With fewer new companies being formed, job turnover and job mobility have declined. In addition, fewer companies with increased bargaining power over employees has resulted in lower wages for many. For small companies trying to compete with large firms, the deck is unfavorably stacked. For example, we have long been critics of the Dodd-Frank financial reform act because it was largely written by lobbyists who were working to push the interests of the largest financial institutions. 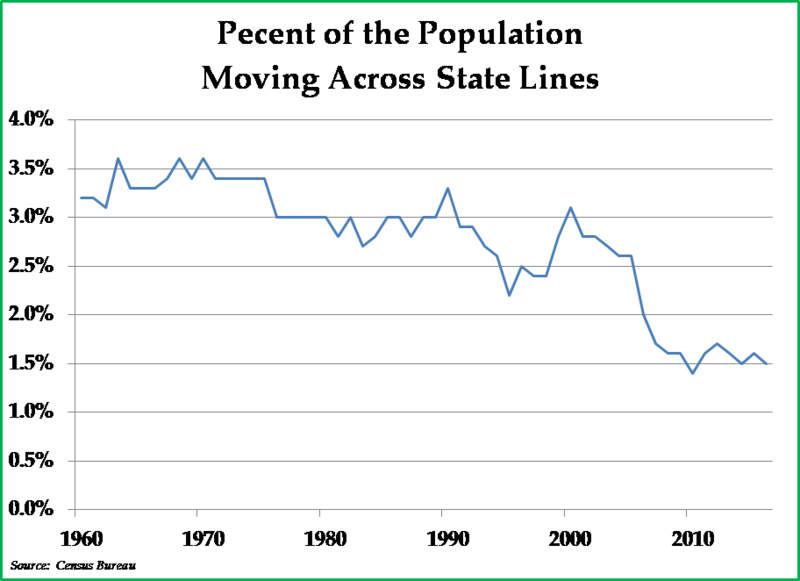 The most important development stemming from the implementation of Dodd-Frank has been the increase of barriers to entry; today, it is increasingly difficult for small banks and financial services companies to thrive. Meanwhile, the largest banks like Wells Fargo are able to disregard regulations and harm consumers without significant business repercussions. For the economy, less competition means less innovation and less productivity growth. Monopoly companies are less likely to invest in research & development or in capital improvements to enhance their competitiveness; indeed, both measures have grown anemically in recent years. Some companies, like Valeant Pharmaceuticals, have built their business models around acquiring companies and then cutting out all research & development expenditures immediately after the acquisition closes. With declining levels of investment and correspondingly weak productivity growth, robust economic growth is more difficult to achieve. For the political system, as economic power is concentrated in fewer hands, the political sway of American corporations is also far greater. Supreme Court Justice Louis Brandeis, a strong proponent of antitrust enforcement, once said, “We can have democracy in this country, or we can have great wealth concentrated in the hands of a few, but we can’t have both.” This important principle applies to both people and corporations alike. For investors, the impact of corporate concentration is mixed. As corporate concentration increases and the general level of competition declines, companies have an easier time exerting market power over customers, vendors, employees, and regulators to boost profits. On the other hand, increased monopoly power results in a less dynamic economy with lower economic growth. Lower economic growth negatively impacts earnings growth, while poor productivity growth makes it difficult for the general standard of living to improve. As long as antitrust enforcement remains a tertiary policy priority, the economic status quo is likely to continue, characterized by high profit margins, low labor mobility, low business formation, weak productivity gains, and an increasingly sclerotic economy. However, history is cyclical, just like markets. For 40 years, the FTC and the Department of Justice have generally taken a do-nothing approach towards corporate consolidation and anti-competitive behavior. Since the 1980s, the pendulum has been swinging in favor of corporate concentration. Eventually, as the political, economic, and social effects of increased corporate concentration become increasingly apparent to dissatisfied voters, a political backlash should become inevitable sometime in the intermediate period ahead. Thus far, antitrust speeches have not yet translated into any significant antitrust enforcement actions. The Trump administration, despite its self-described populist leanings, seems disinclined to pursue antitrust actions vigorously. Meanwhile, companies which enjoy monopolistic profits, such as Google, Facebook, and Comcast, continue to spend vigorously on lobbyists and monopoly-friendly economic studies. That being said, we do expect U.S. antitrust enforcement to increase in the coming years, resulting in more limited power for monopolists and reduced barriers to entry for competitors. We do not know exactly when the tide will turn, and it likely will not occur during the current presidential administration. 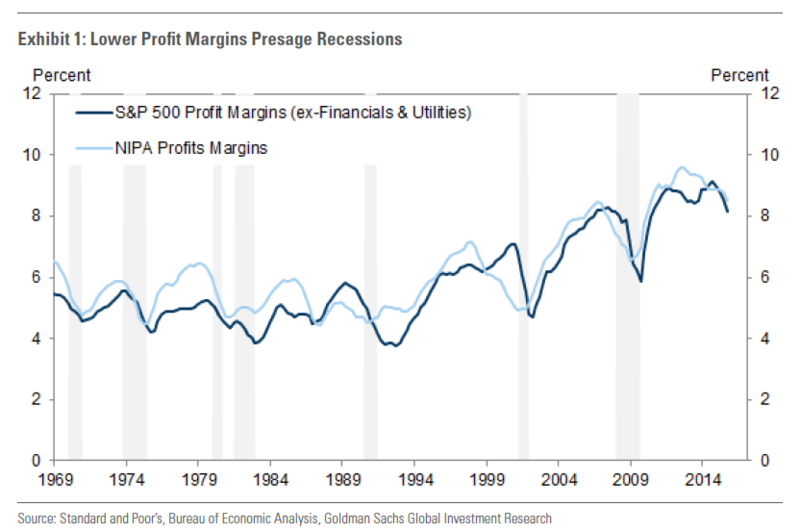 As demonstrated in the chart below, U.S. corporate profit margins have steadily increased due to declining interest rates, flat wages for workers, and increasing corporate concentration. Corporate profit margins, much like history, tend to be cyclical and mean reverting, and the fat profit margins of U.S. companies are one excellent reason to be less bullish of the investment returns that the U.S. equity market will likely generate over the next five to ten years. When profit margins may be near a cyclical peak, the gains from further profit margin expansion, should that occur, are more limited, while the losses from profit market compression, should that occur, loom large. On behalf of our shareholders, we try to invest in individual companies where the investments are not dependent on high profit margins continuing or expanding further in order to justify our valuation. Rather, we seek to buy shares in companies where profit margins are depressed temporarily or where the market expects profit margins to compress and remain low. In addition, we have been diversifying our equity holdings in recent years to increase Appleseed’s allocation to foreign stocks. Ironically, profit margins are lower overseas due in part to stricter antitrust enforcement, exemplified by the record antitrust fine of $2.8 billion charged to Google by the European Commission (EC). Google got caught red-handed by the EC for scraping ratings and comments from Yelp and TripAdvisor in an anti-competitive and abusive manner. Due in part to a more rigorous antitrust environment overseas, we are increasingly attracted to foreign companies and U.S. companies with significant foreign operations whose profit margins generally reflect a more rigorous antitrust enforcement environment. Indeed, whether it is in the United States or elsewhere in the world, investing in companies with lower than normal profit margins is often an attractive proposition. With lower than normal profit margins, the reward from improving profitability seems greater and the risk from compressed margins seems less worrisome. In monopolistic industries, these investment set-ups (where profit margins are low) are generally few and far between today. While this has nothing whatsoever to do with investing, we want to provide the fantastic news that one of our valued colleagues, Matt Blume, competed in the Berlin Marathon in September with a time of 2:18:54; this personal record allowed Matt to qualify for the U.S. Olympic trials. We are beyond thrilled for Matt, and we are proud of him too. For those of you who might not know Matt, he has been commuting with his legs for years in his quest to make the Olympic trials; this is a life-long dream come true for him. Congratulations, Matt! We very much appreciate having your trust to manage your investments, and we similarly are deeply appreciative of your investment patience, which is such a critical factor in generating attractive long-term returns. If you have any questions about this letter or any of our investment strategies, please do not hesitate to contact Colin Rennich, Appleseed Capital’s Director of Sales. His email address is colin@appleseedcapital.com. Thank you again for your continued support and your trust in our ability to manage your investments. Appleseed Capital is the impact investing arm of Pekin Singer Strauss Asset Management. The views and opinions expressed in this material are those of the authors. While we believe we have a reasonable basis for our appraisals and we have confidence in our opinions, actual results may differ materially from those we anticipate. These opinions are current as of the date of this letter but are subject to change. There is no guarantee that any forecasts or opinions in this material will be realized. Information should not be construed as investment advice nor be considered a recommendation to buy, sell or hold any particular security. This is not an offer to buy or sell, nor a solicitation of an offer to buy or sell an interest in any fund, security, or other financial instrument. Any investment in the strategy is speculative and involves a high degree of risk. Investors could lose their entire investment. An investor must be able to bear the risks involved and must meet suitability requirements relating to such investment. Appleseed Capital is not, and does not purport to be, an advisor as to legal, taxation, accounting, financial or regulatory matters in any jurisdiction. The recipient should independently evaluate and judge the matters referred to in this Presentation in consultation with their own tax, legal and financial advisors. Source: Spectrum Sports, Inc. v. McQuillan, (1993).